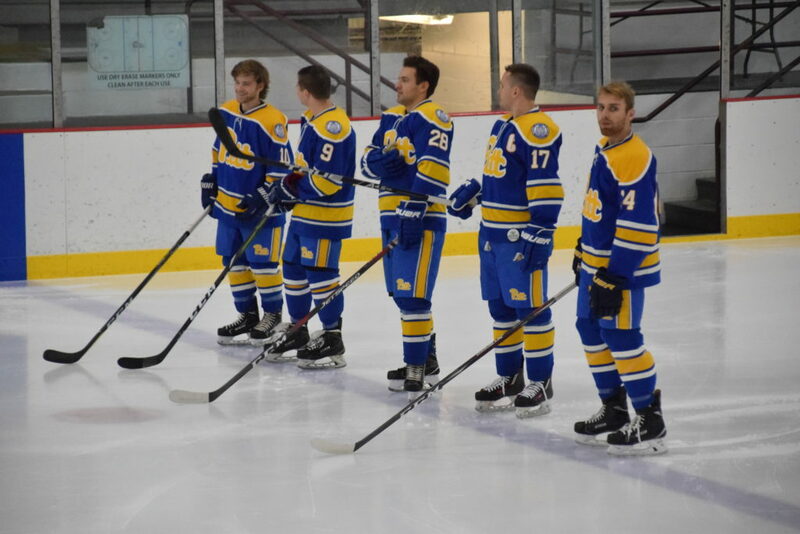 HARMAR TWP., CRANBERRY TWP., Pa. — The wildest weekend of the ACHA season ensued in the CHMA Friday and Saturday. On Friday night, the Pitt Panthers snapped their seven game losing streak by defeating the Duquesne Dukes 3-0. Meanwhile, the IUP Hawks were handed their second loss in three games and first conference loss by John Carroll, 7-3. The Blue Streaks broke their own losing streak with the victory, which had stretched to nine games, including four conference losses. On Saturday, neither Pitt nor John Carroll were interested in starting another losing streak, as the Panthers bested IUP 5-3 at Alpha Ice Complex and Blue Streaks traveled to Morgantown and left with a 4-3 victory over West Virginia. Duquesne salvaged their weekend with a dominant 4-2 win over Slippery Rock at UPMC Lemeuix Sports Complex. It was a weekend of David toppling Goliath, as the top two conference teams went a combined 1-3 and the bottom two went 4-0. Pitt got started early on Friday night against the Dukes with a goal just four minutes in by Bernardo Vieira, his first of the season. The Panthers controlled the flow of the game early and often, taking a 6-1 advantage in shots through most of the first period. After the opening score, the Dukes did manage to get some life, albeit not on the scoreboard. Still, defenseman Manny Mancha played with ferocity in an attempt to tie the game. Mancha drove hard to the net and peppered Panthers goaltender Matt Snader with shots from the point but Snader would not budge. Pitt added to their lead in the second period with a goal by Jack Bertolami, also his first of the season, and then Max Milan added a shorthanded, unassisted goal in the third period to put the game away. Pitt hadn’t scored three goals since their home opener on October 5 versus Kent State. The Panthers then defeated IUP by a score of 5-3 on Saturday at Alpha Ice Complex. Pitt head coach Stu Rulnick was pleased with his team’s performance and hopes the weekend will act as the corner the Panthers needed to turn to have success this season. On Saturday, Duquesne scratched veterans Manny Mancha and Dan Bigley in favor of more young players, such as Justin Todd and Clinton Oshell. Infusing young speed into the lineup helped the Dukes set the tone early against Slippery Rock as they skated circles around the Pride for most of the first period. Duquesne had three power play opportunities in the first period, finally cashing in on the third one late in the period on a goal by sophomore forward Chris Nathan. Sophomore PJ Breslow took a feed from rookie Justin Todd to put the Dukes up 2-0 at the end of the first period. Slippery Rock forward Shane Riley cut the Duquesne lead in half with a goal early in the second period as the Pride looked more aggressive to the net, finally taking the lead in shots. Sophomore Stephen D’Elia added another Duquesne goal to take a 3-1 lead. Midway through the period, Duquesne defenseman Mack Geissler was called for holding against Slippery Rock forward Jamie Mauro, who promptly slashed Geissler aggressively before realizing the ref was watching. On the ensuing 4-on-4, senior Ryan Sweeney gave the Dukes all the insurance they needed to give themselves a 4-1 lead. Slippery Rock would get one back in the third on a goal by Tom Kimmick as they nearly doubled their shots on goal in that period alone (from 25 at the end of the second period to 49 at the end of the game), but goaltender Alex Taylor looked six feet wide and bulletproof and would not budge, allowing his team to prevail 4-2. Overall, Slippery Rock was sent to the box eight times including a 10-minute misconduct against Mauro midway through the third period. Duquesne was called for four penalties, which included Geissler’s match with Mauro in the second. The Dukes only had to kill three penalties, as opposed to Slippery Rock being required to kill off seven. Duquesne goaltender Alex Taylor saved 47 of 49 shots for his fifth win of the season. Through nine starts, he is 5-4 with a 0.913 SV% and a 2.86 GAA. Slippery Rock goaltender Jon Szynalski made 30 saves on 34 shots. He is 3-2-1 on the season, allowing 19 goals for a 0.907 SV% and a 3.16 GAA. John Carroll and Pitt each got their first two conference wins, sweeping their weekend series and snapping losing streaks of nine and seven games against conference leaders IUP and Duquesne, respectively. IUP lost both of their weekend games while Duquesne managed a weekend split, pulling into a tie for the conference lead with the Hawks.